see all Posterior Cruciate ICD-10 codes. 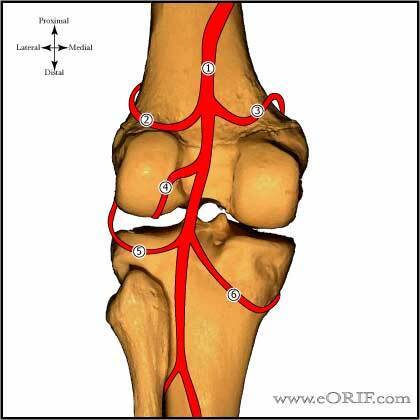 717.84 = old disruption of posterior cruciate ligament. 844.2 = sprain and strains of knee and leg; cruciate ligament of knee. Most commonly from direct blow to the anterior tibia with the knee flexed ("dashboard injury"), or hyperflexion with a planter flexed foot (most common cause in athletes). Also can occur with hyperextension. Long-term PCL laxity may lead to late patellar and medial femoral condyle chondrosis. 95% of PCL injuries occuring in a trauma setting have associated Injuries. (Fanelli GC, Arthroscopy 1995;11:526). Isolated PCL injuries are more common in athletic injuries. (Parolie JM, AJSM 1986;14:35). PCL insufficiency leads to increased contact stresses and cartilage loads in the patellofemoral and medial compartments with increased arthritis..
Insertion: Posterior tibia, 1-1.5cm below the articular surface. (Girgis FG, CORR 1975:216-231). Length: 38mm; Intra-articular length = 30.7 +/- 2.6mm (Miller MD, Am J Knee Surg 1995;8:68). Width: 13mm. (Harner CD, AJSM 1995;23:736). Posterior drawer test done with knee flexed 90 degrees is the most accurate test. (Covey DC, JBJS 1993;75A:1376-86). Increase in ER >10 degrees at both 30 and 90 degrees of knee flexion indicates both PCL and posterolateral corner injury. Quadriceps active test-supine, leg supported in 70-90 degrees flexion with leg completely relaxed. Pt then contracts quads without extending knee. With PCL rupture tibia shifts (reduces) forward 2mm or more. Isolated PCL injuries generally to not cause functional instability. Significant instability indicates combined ligament injury, usually Posterolateral Corner Injuries. A/P, lateral, sunrise, tunnel knee films. May see subtle posterior tibial translation. Evaluate for avulsion fractures. MRI scans: 96-100% accurate in determining all posterior cruciate ligament (PCL) injuries. (Fischer JBJS 73A:2-10 1991). PCL appears as thick dark band extending from the medial femoral condyle to the posterior tibia best seen on oblique sagittal images. PCL disruption = discontinuity, abnormal course, or fluid signal traversing the ligament on T2 images. Chronic PCL injuries can have continuity of the PCL fibers on MRI but have clinical instability (OKU-11). Isolated Grade I= palpable but diminished stepoff (0-5mm). Non-op treatment with PT for quadriceps strengthening. Clinical efficacy of bracing has not been determined. (Parolie JM, AJSM 1986;14:35). Isolated Grade II= lost their stepoff, but the medial tibial plateau cannot be pushed beyond the medial femoral condyle (5-10mm). Non-op treatment with PT for quadriceps strengthening. Clinical efficacy of bracing has not been determined. Isolated Grade III = complete PCL injuries stepoff is lost, and the tibia can be pushed beyond the medial femoral condyle (>10mm) and has an obvious positive posterior sag. Generally non-op treatment with PT for quadriceps strengthening. Consider PCL Reconstruction. Clinical efficacy of bracing has not been determined. Combined PCL injury with varus thrust = PCL injury with assoicated ligamentous injury, usually PLC. PCL Reconstruction indicated. Chronic PCL insufficiency = consider High tibial osteotomy; opening medial wedge with increased tibial slope. Bony avulsion fracture = generally repaired primarily. (Torisu T, JBJS 1977;59A:68). 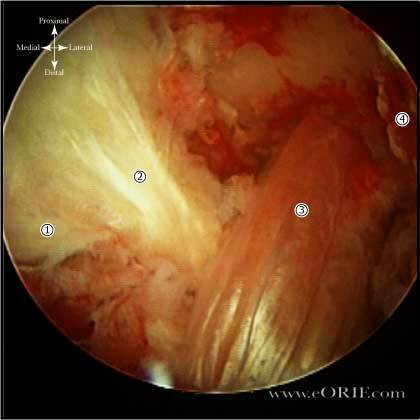 LCL, Posterolateral corner: up to 60% incidence of associated injury (Fanelli GC, Arthroscopy 1995;11:526). 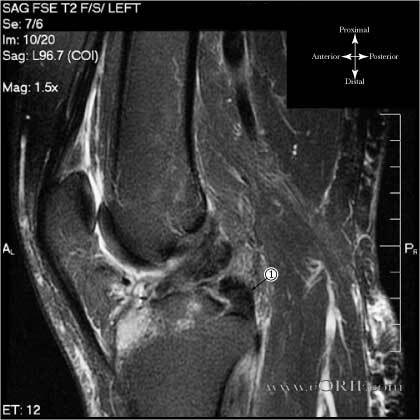 Meniscus tear: >20% incidence of associated injury. Isolated PCL injuries generally have satisfactory outcomes with non-operative treatment with most athletes returning to sports. (Shelbourne KD, AJSM 1999;27:276). Long-term outcomes are generally similar to that of medial meniscal tears with arthritic changes being the limiting factor instead of instability. 90% still not pain, 65% report activity limitations, 43% difficulty walking. (Keller PM, AJSM 1993;21:132). Arthritic changes in the medial femoral condyle and patella are generally noted in chronic PCL deficient knees and are thought to result form altered contact pressures. Harner D, Hoher J: Evaluation and treatment of posterior cruciate ligament injuries. AM J Sports Med 1998;26:471-482. Harner CD, Hoher J: Evaluation and treatment of posterior cruciate ligament injuries. AM J Sports Med 1998; 26:471-482. Clancy WG Jr., Shelbourne KD, Zoellner GB, et al: Treatment of knee joint instability secondary to rupture of the posterior cruciate ligament: Report of a new procedure. 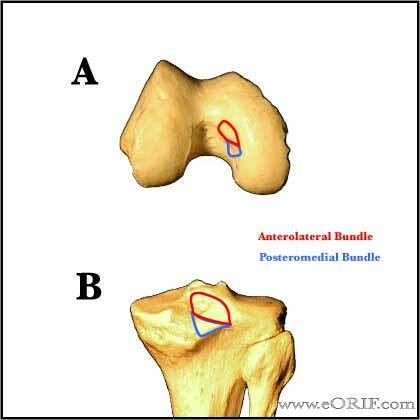 J Bone Joint Surg 1983; 65A: 310-322. Shelbourne KD, Davis TJ, Patel DV. The natural history of acute, isolated, nonoperatively treated posterior cruciate ligament injuries. A prospective study. Am J Sports Med. 1999 May-Jun;27(3):276-83. McAllister DR, Petrigliano FA. Diagnosis and treatment of posterior cruciate ligament injuries. Curr Sports Med Rep. 2007 Oct;6(5):293-9.